The popularity of starcloth linings has increased and as such the sophistication of the range available is now much greater. Now popular are LED starcloth with colour changing abilities. Leisure Interiors carries a range of starcloth for hire and is pleased to partner some of the leading major installation providers. 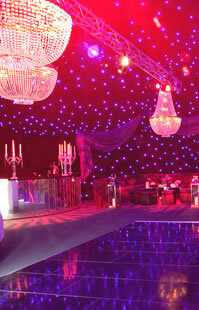 Leisure Interiors manufactures LED Starcloth for all types of structures. We provide a Starcloth repair service and can quote for changing over from fibre optic Starcloths to the latest LED systems. Leisure Interiors has designed and developed a lightweight and easy to use LED controller, which can also be used for light to sound requirements. "Many thanks for the interior supplied to this special event. Attention to detail and creativity were second to none."